I don’t know whether Keynesian economics is best described as a perpetual motion machine or a Freddy Krueger movie (or perhaps even the man behind the curtain in the Wizard of Oz), but it’s safe to say I’ll be fighting this pernicious theory until my last breath. That’s because evidence doesn’t seem to have any impact on the debate. It doesn’t matter that Keynesian spending binges didn’t work for Hoover and Roosevelt in the 1930s. Or for Japan in the 1990s. Or for Bush or Obama in recent years. What does matter, by contrast, is that politicians instinctively like Keynesianism because it tells them their vice is a virtue. Instead of being a bunch of hacks that can’t resist overspending in their quest to buy votes, Keynesian theory tells them that they are “compassionate” souls simply trying to “stimulate” the economy. And to make matters worse, there are plenty of economists (many of whom are on the government teat) who act as enablers, telling politicians that bigger government somehow can jump-start growth. For instance, the Paris-based Organization for Economic Cooperation and Development (OECD) has just issued recommendations for ways to boost a sluggish global economy. Given that the organization’s lavish budget comes from its member governments, you won’t be surprised that it is licking the hand that feeds it and recommending that politicians should get to spend more money. A stronger collective fiscal policy response is needed to support growth… Governments in many countries are currently able to borrow for long periods at very low interest rates, which in effect increases fiscal space. Many countries have room for fiscal expansion to strengthen demand. …Investment spending has a high-multiplier, while quality infrastructure projects would help to support future growth. If the OECD is right, there are supposedly a lot of “shovel-ready” infrastructure jobs that would be wise investments, so why not borrow lots of money in today’s low-interest rate environment, finance a bunch of new spending, and magically boost growth at the same time? Needless to say, I’m very skeptical about the federal government having an infrastructure party. We would get a bunch of bridges to nowhere, lots of fat contracts to line the pockets of unions, some mass transit boondoggles, and more horror stories about cost overruns. Oh, and don’t forget that the politicians would decide that all sorts of additional categories of spending count as “investment,” so money also would get squandered in other areas as well. But let’s set that aside and deal with the underlying economic issue of so-called stimulus. Politicians in America and elsewhere engaged in several years of Keynesian spending when the downturn began in 2008. That didn’t work. In more recent years, they’ve been engaging in lots of Keynesian monetary policy, and that hasn’t been working either. Now they want to return to the option of more deficit spending. Why should we believe that a policy that has repeatedly failed in the past somehow will work this time? 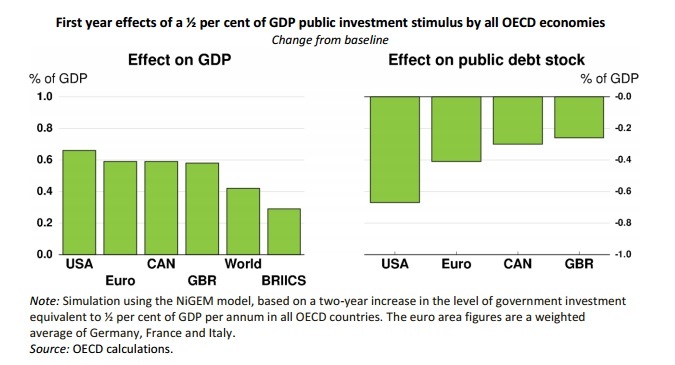 If you ask the OECD bureaucrats, they say it will work because they have a model that’s programmed to say more government spending is good for growth. I’m not joking. Just like the Congressional Budget Office, the OECD uses a model that automatically assumes that more spending will lead to more growth. So you plug in a number for some “stimulus” outlays and the model mechanically cranks out data showing better performance. Here’s what the OECD is claiming. Gee, if this is accurate, why don’t we have governments confiscate all the money in the economy, spend it on so-called public investment, and then we can all be rich! Actually, I shouldn’t joke. Some Keynesian reader might take the idea and run with it. P.S. What makes all this especially irritating is that American taxpayers are subsidizing the OECD’s statism. And it’s not just this recent foray into Keynesian economics. Here are other examples of the OECD pushing policies that are directly contrary to the interests of the American people. Now you can understand why I rank the OECD as the worst international bureaucracy. How could these enlightened economists at the OECD forget about the economic concept of opportunity costs of the alternatives that the confiscated money could be spent on and the concept of the public sector crowding out the private sector? Even a layman like myself can put this in a simple framework question: who spends money more wisely and more effectively – the private sector or the public sector? The answer should be obvious and as a result these large institutions full of economists should be telling governments that if they simply got out of the way and removed burdensome taxes and regulations, growth would inevitably ensue. Instead, they promote a tremendous over-reliance on monetary policy (giving government a free pass on their terrible fiscal policy choices) and double down on failed fiscal policy choices that promotes ever more centralized government decision making. The article in “The Economist” 2/20/16? ?, by Jon Berkeley, “Out of Ammo?” may have been the trigger that sparked today’s blog. In it, the author claims that there is still time for “shamefully reluctant politicians” to completely destroy their economies [that’s not exactly what he said]. He recommends (1) a “helicopter drop” of cash [something that’s never worked and has a high probability of inflating the hell out of the monetary system], or (2) a government mandated incomes policy [this guy still has his Franklin Roosevelt 101 Economics book]. There’s more, but I got to dash. “The Economist” has fallen a long way! At any point in time, an economy has a fixed amount of resources. These resources can be allocated by government or by the private sector. The private sector is guided by prices and profits or anticipated prices and profits. Government has no such guide to indicate where to allocate resources and how much. “Investment” by government has the opposite meaning from the private sector, in that government resources are allocated to projects and businesses that cannot acquire “investment” resources in the private market. Because political influence is government’s guide, those projects with the most potential are less likely to get funded, when put in competition with projects with political influence. Redistributed funds are more likely to be allocated to current consumption, whereas if the funds had stayed in private markets, most of the funds would have become private investment, creating future growth that benefits all.